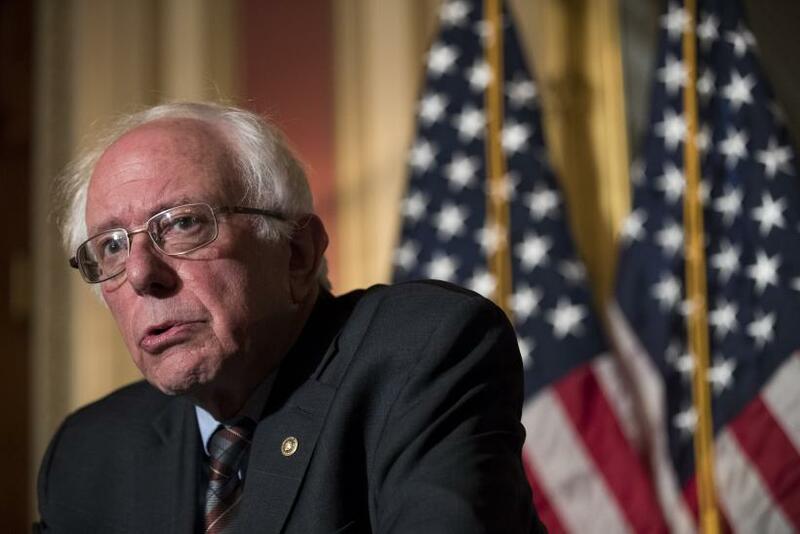 During a speech to thousands of activists in Chicago this weekend, Vermont Sen. Bernie Sanders called the Democratic Party’s political strategy “an absolute failure” and he urged party leaders to begin promoting a more forceful populist economic agenda. Sirota: You said that the Democratic Party's political strategy has been an “absolute failure,” and that it must decide which side it’s on. Why are you still operating within the party? Why don't you start your own party? Sanders: Look, these are enormously dangerous times for this country. We are drifting toward authoritarianism, we are seeing 43 million people living in poverty, we’re seeing this nation move toward an oligarchic form of society where a handful of billionaires control our economy and our political life. You know, I have probably more experience than almost anybody in terms of third party politics. I’m the longest serving independent in the history of the United States Congress, I’ve defeated Democrats, I’ve defeated Republicans. All that I’m saying is, if you look at history it is not so easy to form a third party, to run candidates in 50 states in this country to get the kind of media attention that you need. It ain't easy and the time is late. At this moment what my view is, is that there are many parts of this country where progressives get involved in a very active way. They can become the leadership of the Democratic Party. We showed that within the Democratic primary — taking on the entire establishment. We did quite well. So I think there is potential to make real progress within the Democratic Party and that's what I propose to do. Sirota: You were criticized recently for supporting a Democratic candidate who has at times voted against abortion rights. In Georgia now, Democratic congressional candidate Jon Ossoff says he opposed to raising taxes on the wealthy and opposes single payer healthcare. You and many progressives have argued for the opposite. Is the Democratic Party a big-tent party, big enough to include both sets of those positions? Sanders: I think in terms of the most important issues facing this country, which would include finally demanding the wealthy and large corporations start paying their fair share of taxes, moving toward universal healthcare, rebuilding our crumbling infrastructure, raising the minimum wage, etc, etc, a vast majority of the people support those ideas. Now, there are more conservative districts, and I can understand somebody who's more conservative running for office. That's fine. There are parts of this country where people are split, where honest people are not, you know, I've a 100 percent lifetime pro-choice voting record, but there are people who disagree with me. I supported the candidate who's running for mayor of Omaha who I thought put together a very strong progressive coalition; I disagree with him on one issue. So, in general, the momentum is with us toward making the Democratic Party far more progressive. It will not have progressive candidates, or strong progressive candidates in every single district on every single issue, and I think we have to understand that. Sirota: Hillary Clinton during the campaign said single-payer healthcare, “will never, ever happen.” How much opposition to that idea do you see within the Democratic Party? Sanders: There'll be a lot of opposition to it. I think again, the momentum is with us, and I'll tell you why, because while most people, including myself, would agree that Obamacare has done good things, we added 20 million more people to the ranks of the uninsured, did away with this nonsense about pre-existing conditions, etc, etc. I think people also see the limitations of the Affordable Care Act and are asking why it is that we can't join the rest of the industrialized world and guarantee healthcare to all people. Why it is we spend probably two-and-a-half times per person than they do in the United Kingdom. Why? And they guarantee healthcare to all people. The momentum is with us. The opposition from insurance companies, drug companies, and conservatives within the Democratic Party will be enormous. Transforming our healthcare system, which is 17 percent of our GDP, will be a monumental struggle, but I think time is on our side. Sirota: You participated in civil rights protests and you supported pro-equality legislation throughout your career, and yet you were attacked during the campaign at times by some who said you did not care about communities of color. How did that feel? Sanders: That was personally very painful. It was very painful, but what I am proud of is that we ended up winning within the African-American community, within the Latino community, by the way. Very, very strong support in virtually every state in this country. We won the youth vote, people under 40 in the African-American community. So I think it was also a generational issue. Older African-Americans felt comfortable with the Clintons, they knew them, they liked them. But I think we have made real inroads among young people. Sirota: What did you learn about communities of color that perhaps you hadn't known before the campaign? Sanders: That's a very fair question, and what I learned is that there are African-American communities around this country where people feel extremely intimidated by the local police, and it's not just the examples, the horrible examples of police murders that took place with people getting shot in the back. It is just the fear of sending your kid out to the grocery store and what might happen to him or to her. That degree of intimidation, of oppression in inner cities is something I was not as aware of at the beginning of the campaign as I certainly was by the end. Sirota: You described yourself in the past as a democratic socialist and much of your agenda and message is a critique of capitalism. Do you believe fundamentally that capitalism itself is a problem? Sanders: Well, what I believe is that, I believe two things. Number one, I believe that human beings, because they are human beings, are entitled to certain rights. You're a human being, you're entitled to healthcare, whether you're rich or you're poor. You and your kids are entitled to quality education, whether you're rich or you're poor. You're entitled to decent housing. So the question of rights is to me very, very important. Second of all, what capitalism does, it says what the good life is about, what you have got to strive for is to make as much money as you possibly can. That's the ulterior. We judge you as a person, not whether you're a great teacher, whether you're a great childcare worker, whether you're a physician saving lives every day, you are a multi-billionaire. And by the way, increasingly, we don't even care how you make your money. So somebody like Donald Trump becomes the example of what we are striving for. Here's a guy who has been involved in 3,500 lawsuits in his business life. He lies all the time, but he is a multi-billionaire and this is the kind of mentality and character that we should be approving of. I don't accept that. I think that being a good human being doesn't mean stepping on other people in order to get rich. It means sharing your life with other people, understanding the importance of community. That's another aspect of capitalism that concerns me. Sirota: Have you ever met Donald Trump? Sanders: I've been in the same room with Trump, I've been invited to meet with him in the White House, but my nervousness about Trump is such that I certainly do not want to be used as a photo opportunity. So if Trump, for example — Trump has talked about infrastructure, Trump has talked about the high cost of prescription drugs. If he wants to sit down and negotiate specific legislation I would be happy to do that, but I'm not going to be there just to get a photo opportunity and have it used for his advantage. Sirota: Are you at all optimistic that there are some issues and policies on which you can work constructively with Trump? Sanders: Originally I thought there were two places. One was infrastructure. He talked about a trillion dollar infrastructure program, which is exactly what I raised during the campaign. He talked about the high cost of prescription drugs and his willingness to take on the pharmaceutical industry. Unfortunately, as I think most Americans now know, Trump lies a whole lot of the time and a lot of his campaign was just a lot of lies. The infrastructure plan that he brought forth was a disaster. Instead of a trillion it was 200 billion, and essentially he wants cities and towns all over this country to sell off their water systems, their roads, their bridges, to Wall Street and to the private sector to raise the money to do that. That’s just a disastrous, absurd plan. We will see the nature of the negotiations that take place. So, can we do something on infrastructure? I certainly hope so, because we can create up to 15 million jobs, and we certainly need to rebuild our roads, bridges, and water systems. Second of all, in terms of prescription drugs, he talked a good game. We have introduced legislation that would allow Americans to purchase much lower cost medicine from Canada, from other countries. We will see if he comes on board. I suspect he probably won’t if all of that was just talk and lies. Sirota: Some have argued that the Russia-Trump controversy has gotten too much attention, and that it is distracting from other important economic issues. Sanders: I understand the argument, and I understand the absolute need to focus on issues like raising the minimum wage to 15 bucks and hour, pay equity for women, rebuilding our infrastructure, moving toward a single payer healthcare system. No debate we have got to do that, and we cannot succeed in winning the issues or winning elections simply by criticizing Trump. I accept that, and I am one of the leaders in trying to do that. On the other hand, you can not ignore the fact that a major nation on this earth, Russia, and their leader, Vladimir Putin, attempted to undermine the American democratic process by cyber attacks in the United States at our election, and doing that in France, and doing that in other countries around the world. That is unacceptable and that has to be dealt with. You can not ignore the fact that right now there is an investigation to look at whether or not Trump’s campaign colluded with Russia in that effort, and whether or not Trump obstructed justice by firing James Comey as FBI director. So the difficulty is, there are an enormous number of important issues. We got to deal with them all, but it’s not either-or. We’ve got to deal with them all. Sirota: The Democratic Party leadership has lost the White House, Congress, 1,000 state legislative seats and many governorships. Why is the party still run by the same group of people who delivered that electoral record? Sirota: After decades in public office, what do you think remains the least well-understood aspect of American politics? Sirota: The least understood, or the least discussed, has to do of course with class issues, because who’s going to talk about it? NBC is not going to talk about it, CBS, The New York Times are not going to talk about it. The reality of American society today not talked about in Congress or the corporate media is that we are moving toward an oligarchy. Our political system is entirely corrupt as a result of Citizens United. Who would have believed 20, 30 years ago that a handful — a handful! — half-a-dozen billionaires could spend many, many, many hundreds of millions of dollars on elections from school board to the White House and buy elections? This is just an outrage. It’s why we need not only to overturn Citizens United, but move to public funding of elections. Second of all, in terms of income and wealth inequality, the idea that the top one-tenth of 1 percent now makes almost as much wealth as the bottom 90 percent; the top 1 percent earns 52 percent of all new income; it is incredible. It is absolutely incredible, but it is easier for the media to say, “Let's talk about racism. Let's talk about sexism. Let's talk about homophobia,” than talk about the movement of this country into oligarchy. So, that is an area that does not get ... You know, the oligarchs, needless to say, are not enthusiastic about talking about oligarchy in America.